After an hour or so of FFXIII I have some initial impressions; both good and bad. -My 360 version has pre-rendered cutscenes that looks low-res compared to the in game engine. It is definitely not running 1080p. -The floaty camera controls really bother me. I think it has acceleration on it or something. It drives me crazy when I want to look around quickly. -Fights get ratings for some reason, but that reason isn't explained. -So far no sign of a leveling or a progression system at all. -I have no idea what is going on in the story... two groups are fighting, I guess... for some reason. -The flow of battle is constant and exciting. -Controlling one member of the party feels different, but it's working for me. -I like the art style. -The in-game engine is really crisp (I wish they would do more in-engine and less pre-rendered). You found a screenshot of my favorite cut scene so far! Of course I'm like 2 hours in. 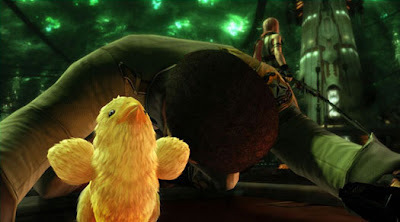 Well, I like the baby Chocobo.